Football Jumpers .com » Blog Archive » Footy ‘s Off Season ? Footy ‘s Off Season ? Who says AFL Football has an off Season ? The 2012 home and away fixture has been announced , along with the NAB Cup pre - season round of matches . Coaches are moving around , or being appointed . St Kilda FC has announced former AFL Coach Dean Laidley , will join new appointee Scott Watters , as an assistant coach . The second of the International Rules Games will be played on Friday night on the Gold Coast . Confident tourists , the Irish team , will take on the Australian compilation team , in their second game , hoping to continue their winning form . 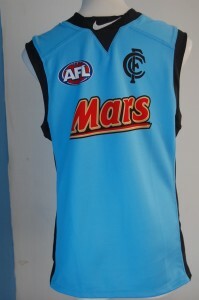 The NAB Cup commences in February 2012 and continues into March 2012 promising fans much pre-season entertainment . Those fans lucky enough to score a new football jumper , jersey , guernsey for Christmas are delighted . This entry was posted on Thursday, November 3rd, 2011 at 7:39 am	and is filed under AFL, football jumpers, NRL. You can follow any responses to this entry through the RSS 2.0 feed. Both comments and pings are currently closed.